Fantasy Flight Games is proud to announce Hand of the King, a new card game of courtly intrigue for two to four players! Hand of the King is a fast-paced card game of cunning deals and clever maneuvering. Each turn, you and your opponents will compete, using the services of Varys, the Master of Whispers, to gain influence over the Great Houses of Westeros. The player with the most influence at the end of the game becomes the next Hand of the King, but to get there, you’ll need to make alliances and know when to betray your former allies. At the beginning of the game, the court of King’s Landing is laid out before you and the other players. Thirty-five character cards and Varys are all placed in a randomized six-by-six grid. Your goal is to claim the banners of as many Great Houses as possible, because at the end of the game, whichever player has the most banners becomes the king’s next Hand. To gain the support and the banner of a House, you must first tempt the House’s principal lords and ladies to join your conspiracy—and that is where Varys comes into play. Each turn, you’ll choose a direction to move Varys within the court of King’s Landing and name a House. Varys can move as far as you want in the chosen direction, but he must end his movement on a character who belongs to the House that you named. Then, you’ll claim the character Varys landed on, as well as any characters from the same House that Varys passed over in his movement. For instance, in the example above, you choose to move Varys to the left and name House Stark. You end your movement on Eddard Stark, but you also claim Bran Stark, since you passed over him on your way to Eddard! As soon as you claim at least as many character cards belonging to a particular House as any opponent, you’ll claim that House’s banner and place it in your own play area. Though it may not be immediately obvious, the movements of Varys give you plenty of opportunities to scheme and deliberate with your opponents. Two moves may be equally good for you, but one may be significantly better for your opponent. Of course, that doesn’t mean you need to automatically avoid that move—it just means you need to make sure you’re getting a good deal for showing your favor. Each of the Great Houses has a different number of character cards, making it easier or more difficult to secure their loyalty over the course of the game. What’s more, when the final card belonging to a House is claimed, you can choose one of six companions revealed at the beginning of the game and trigger its ability! These companions can have a powerful effect on your chances of victory. 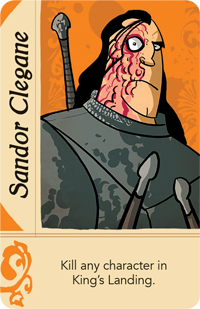 You may call on Sandor Clegane to kill any character in the court, permanently removing it from the game. 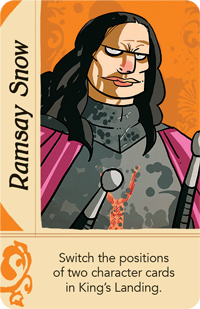 Or, you may use Ramsay Snow to switch the position of two character cards in King’s Landing. With fourteen different companions, every game has the potential to be completely different, depending on how you play. The Hand of the King is the second-most powerful man in the Seven Kingdoms, and in many ways, he avoids the great misfortunes that often befall the king. This feast is your one and only chance to make your bid for power. Call upon the Master of Whispers and sway the Great Houses of Westeros in your favor. 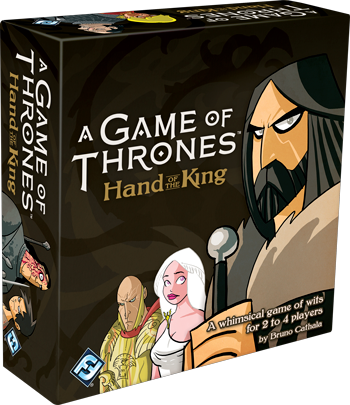 You can look for Hand of the King at your local retailer in the fourth quarter of 2016! 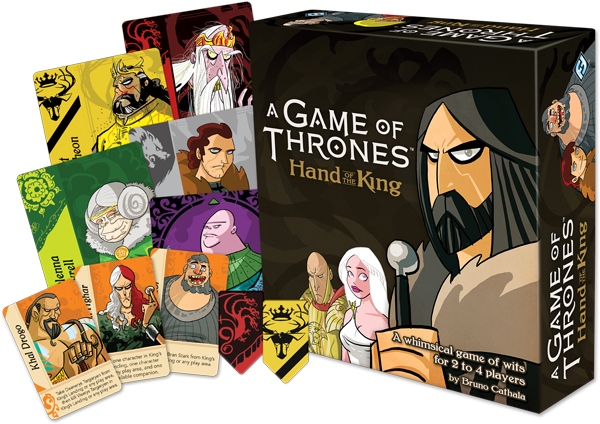 Hand of the King is a fast-paced card game of intrigue in King's Landing for two to four players. Each turn, you must move Varys through the courts, gaining the support of iconic characters from A Song of Ice and Fire. At the end of the game, the player with the most support becomes the new Hand of the King and claims victory!